Burnham & Berrow’s Lee Corfield remained cool at sun-baked Farleigh Golf Club in Surrey to join the likes of Tony Jacklin and Peter Alliss as winners of the PGA’s Assistants’ Championship. 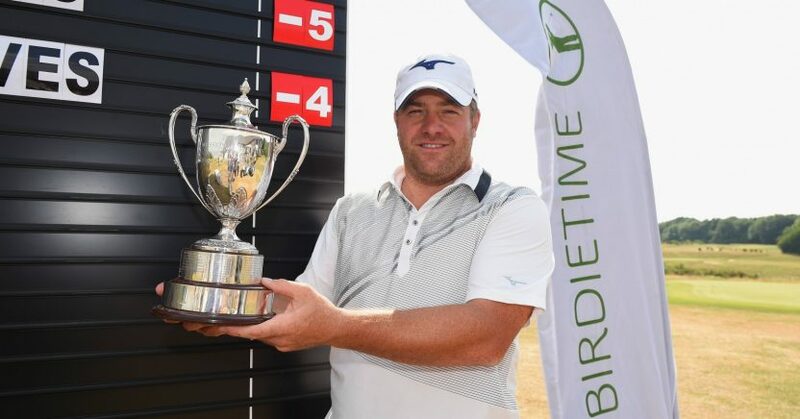 The Somerset player’s margin of victory in the £32,000 Birdietime-supported competition was two shots, but that did not reflect the intensity of a duel with Hertfordshire’s James Watts, which lasted until the 17th hole. Watts set off on the third and final round two pairings ahead of Corfield and four shots adrift of him, and chipped away at the tournament leader’s advantage. And by the time Corfield reached the turn, Watts had trimmed his lead to one. And when the pursuer birdied the 16th the pair were level. But then disaster befell the challenger from Kingsway Golf Centre. A triple bogey at the par-four 17th left Corfield knowing what he had to do to claim the £5,000 first prize. Having opted for caution off the tee to avoid dunking his ball in the penal rough, he arrived at the 18th green with the comfort of having four putts for victory. He needed three, the ball defiantly perching on the hole’s rim following the second, and forcing him to tap it home for the win. Watts, by contrast, was left to ponder on what might have been after finishing second, a shot clear of the trio tied for third place – Adam Reid, Christopher Croucher and Elliott Groves. Reid, who represents Corhampton Golf Club in Hampshire, had begun the day nine shots adrift of Corfield, and was nearer the back than the front of the 40 competitors who made the cut. However, as well as propelling him to within three strokes of the winner, his seven-under-par equalled the course record set by Isaac Simpson just 24 hours earlier. Graham Roberts of Eaton Golf Club, Norfolk, was another with good cause to celebrate after recording the tournament’s solitary hole-in-one courtesy of a wedge at the par-three 136 yard 13th. Meanwhile, one of the two women to make the cut, Tiverton Golf Club’s Jessica Bradley, signed off with a final round of one-over for a 54-hole one-over-par score of 217 to finish 14th. Leading scores:L Corfield (Burnham & Berrow) 209 (-7); J Watts (Kingsway) 211 (-5); A Reid (Corhampton), E Groves (Romsey), C Croucher (Singing Hills) 212 (-4); A Clough (PGolfCoaching@Pedham), Jamie Howarth (Davenport) 213 (-3).